Subclinical hyperthyroidism is a potentially serious thyroid problem which can go undiagnosed if you aren't looking for it. This condition can also be confused with other medical conditions which means that not everyone with this disease should undergo treatment. Can Thyroid Medication Cause Subclinical Hyperthyroidism? Subclinical hyperthyroidism is a thyroid condition which is being diagnosed more and more frequently, mostly due to our enhanced ability to assess for thyroid function. Because Doctors have been able to order cheap thyroid tests on many patients, the diagnosis and patterns for some thyroid diseases are being seen more and more commonly. Subclinical hyperthyroidism is actually a thyroid condition which is diagnosed based upon thyroid lab tests (1). You may be diagnosed with this condition if you have a low-normal TSH accompanied with normal free thyroid hormones (both T3 and T4). But, this condition is not quite as simple as looking at thyroid lab patterns, you actually need to have more information. While the TSH test (thyroid stimulating hormone) is an effective way to assess thyroid responsiveness to your pituitary, there are medical conditions which can artificially suppress your TSH and make your clinical picture more complicated. Conditions such as euthyroid sick syndrome, and even some medications (such as steroids), can suppress the TSH and make it look like you have subclinical hyperthyroidism. What complicates diagnosis, even more, is the fact that most patients who have this condition don't have overt symptoms of hyperthyroidism, which means that this condition is usually picked up by routine testing. This is why it's called "subclinical" which basically means that this is a condition which doesn't always cause symptoms. But despite this, there is definitely something going on in your body if you have subclinical hyperthyroidism as evidenced by certain medical conditions which occur more frequently in those with this condition. Patients who have subclinical hyperthyroidism may often start to experience early symptoms of hyperthyroidism such as early bone loss (osteopenia or osteoporosis) or heart problems (such as atrial fibrillation). But what if you are not symptomatic? Is it possible that some other problem is causing your suppressed TSH? The answer is yes which is why you should be evaluated carefully before undergoing treatment for this condition. Believe it or not, the consequences of subclinical hyperthyroidism are still being discovered and evaluated. It is not well known what the impact is of this disease, long-term, on your overall health. So it seems that this condition is causing problems at the metabolic level (in your cells), but these problems may not be manifested as overt symptoms (2). It's also important to remember that subclinical hyperthyroidism may be an early manifestation of some other cause of hyperthyroidism. So, just because you are not symptomatic right now doesn't mean you won't develop symptoms in the future. Disease exists on a spectrum, which means that early on in the course of your disease you may not experience problems until the disease reaches some critical point. Subclinical hyperthyroidism may simply be an early manifestation of this disease and, therefore, a warning sign that something is "off" in your body. This idea may explain why it's hard to pinpoint specific symptoms associated with subclinical hyperthyroidism. With low-grade symptoms such as these, it's easy to see why many people get diagnosed by routine testing. You may present to your Doctor with symptoms such as mild fatigue or depression, both of which can be attributed to working long hours, getting older or other conditions. But, as was mentioned earlier, it's important to identify the presence of this condition because it probably represents an early problem with your thyroid and your body which can potentially be treated early. Testing is one of the fastest and easiest ways to identify that you have a thyroid problem. Basic thyroid lab tests can be ordered by your Doctor and are typically covered by most insurance plans. If you suspect that you have a problem (based on early symptoms) then checking your thyroid function is the next logical step. TSH (Thyroid stimulating hormone) - Thyroid stimulating hormone is produced from your brain (pituitary gland) and gives you an idea of how responsive your thyroid gland is to stimulation by your brain. Low levels of TSH may indicate that you have excess thyroid hormone in your body and is a reflection of your body attempting to reduce further "stimulation" of your thyroid gland. Free T3 - Free T3 is a representation of how much active thyroid hormone is floating around in your bloodstream. High levels of free T3 in your bloodstream may indicate that your thyroid is producing too much thyroid hormone on its own. Free T4 - Free T4 is another thyroid hormone but not as active as T3. T4 must be converted into T3 to be active, but high levels of T4 can turn into T3 through the thyroid conversion process. High levels of free T4 may also be an early indication that your thyroid is producing too much thyroid hormone on its own. These tests can and should be ordered on all patients being evaluated for any thyroid disease (including subclinical hyperthyroidism). TSH - Low-normal level but not completely suppressed down to 0.0. This pattern of thyroid lab test, if also accompanied by problems such as atrial fibrillation, anxiety, depression, or bone loss, may be a sign that you have an early thyroid problem or you may be at risk for developing hyperthyroidism. Even if you have this lab pattern, you should be evaluated for other causes of low-normal TSH including conditions such as TRH related problems, medication-induced TSH suppression (9) and recent dieting/weight loss (10). Subclinical hyperthyroidism can be differentiated from hyperthyroidism based on lab tests and also upon symptoms. Those with overt hyperthyroidism will have lab abnormalities but also experience symptoms such as diarrhea, heart palpitations, weight loss, hot flashes and so on. TSH - Suppressed or obviously abnormal and close to 0.0. Free T3 - Elevated and outside of the normal reference range. Free T4 - Elevated and outside of the normal reference range. Hyperthyroidism differs from subclinical hyperthyroidism in that treatment is recommended to prevent adverse side effects from thyroid hormone on your organ tissues. Untreated hyperthyroidism may result in serious medical conditions and potential consequences such as thyroid storm. These two conditions are NOT the same thing, though they may exist on the same spectrum where subclinical hyperthyroidism is an early warning sign of hyperthyroidism. It may come as no surprise that the same conditions which cause hyperthyroidism are responsible for subclinical hyperthyroidism. They most likely represent an early manifestation of these diseases. Conditions such as Graves' disease, toxic multinodular goiter and even the use of thyroid hormone replacement medication (11) can all result in subclinical hyperthyroidism. Other medical conditions which result in inflammation of the thyroid gland can also result in temporary "subclinical hyperthyroidism" lab-like results. 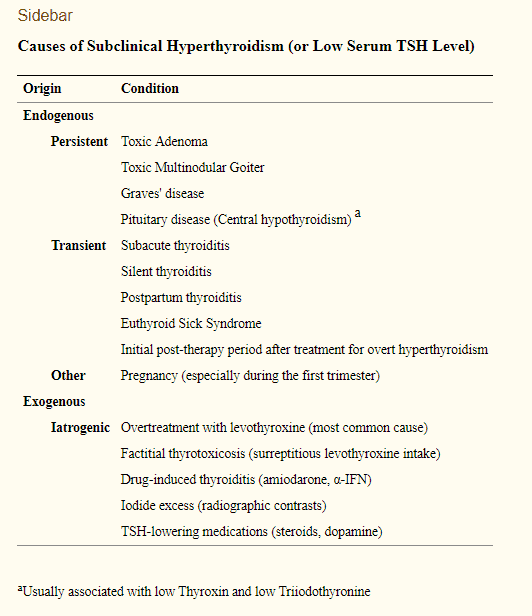 The group of conditions known as "thyroiditis" including postpartum thyroiditis and subacute thyroiditis, all have phases of temporary hyperthyroidism which can look very similar to subclinical hyperthyroidism. The good news is that these thyroid conditions tend to be temporary and should fade over a few months. So, identifying the presence of subclinical hyperthyroidism is important, but it doesn't tell you anything about the "cause" of your condition. You may have to do further testing and digging to figure out what is causing the issue in your body. This can be accomplished through further lab tests, ultrasound imaging of your thyroid gland and a comprehensive medical history taken by your Doctor. Thyroid medication, when taken for thyroid conditions such as hypothyroidism, may cause a reduction in your TSH and may also alter your free thyroid hormones. The goal when taking thyroid hormone (such as Levothyroxine and Synthroid) is to "balance" the TSH and your free thyroid hormones to normal levels. This sounds easy in theory but can actually be quite difficult in practice. Each patient is different in terms of how much medication they will need, the type of medication they respond to and how that medication will impact their thyroid lab tests. 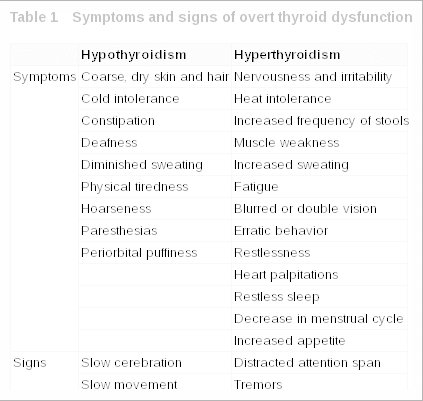 Overusing thyroid medication can result in hyperthyroid symptoms and a lab pattern which mimics subclinical hyperthyroidism (12) (low-normal TSH with normal free T3 and free T4 levels). In some instances, this is actually desirable and the goal of thyroid hormone replacement therapy. An example of this is in certain cases of thyroid cancer. Some doctors want to intentionally suppress TSH levels to prevent this hormone from "stimulating" and "growing" thyroid cancer cells in your body. This doesn't happen very often but it may be necessary in certain cases. Is it possible to gain weight if you have a diagnosis of subclinical hyperthyroidism? The answer, again, is yes (13). While this isn't a common problem among those who suffer from hyperthyroidism there are definitely a few explanations for why this may occur. When you think about hyperthyroidism you should immediately think about weight loss, not weight gain. Hyperthyroidism, even early conditions such as subclinical hyperthyroidism, tend to result from an INCREASE in thyroid hormone in the body. And because thyroid hormone regulates your metabolism (14), more thyroid hormone usually results in weight loss. Weight gain, on the other hand, is one of the hallmark symptoms of hypothyroidism which is a condition with too little thyroid hormone. So how can someone with this condition gain weight? Overuse of anti-thyroid medication - The treatment for hyperthyroidism is to block thyroid hormone production. Overusing this medication can swing you from hyperthyroidism into hypothyroidism and may cause weight gain. Misdiagnosis - Several conditions can result in changes in your thyroid lab tests but they don't necessarily mean that you have hyperthyroidism. Medications may be lowering your TSH - Certain medications, such as steroids, can artificially suppress your TSH. These medications, if used for a long period of time, can also cause weight gain. Diagnosis of Thyroiditis - There are some thyroid conditions which temporarily cause subclinical hyperthyroidism but then may turn back to hypothyroidism over a short period of time. Conditions such as thyroiditis, Hashimoto's thyroiditis and postpartum thyroiditis all fit into this category. Just because you have a low TSH right now doesn't mean it will stay that way. This is why you always need to constantly evaluate your thyroid lab tests. To treat or not to treat, that is the question. And it is a question that many doctors wrestle with when it comes to subclinical hyperthyroidism. Even though this condition may result in heart and bone problems, it is not known if taking antithyroid medication has any beneficial effect (15). Because of this, it is not advisable to treat every patient with subclinical hyperthyroidism. The "conventional" treatment for subclinical hyperthyroidism is much the same as that which is used to treat over hyperthyroidism. Medications such as Methimazole can be used in small doses. These medications act to block your thyroid gland from producing thyroid hormone and they also prevent the conversion of T4 to T3. Your Doctor will determine if you need treatment based off of your symptoms. If you have osteoporosis and/or atrial fibrillation, then it may be a good idea for you to undergo treatment. This should be compared to someone who is completely asymptomatic with no discernible problems related to their thyroid but who also has the lab features of subclinical hyperthyroidism. The use of medications can, and should in most cases, be combined with natural therapies for best results. Natural treatments for subclinical hyperthyroidism include basic lifestyle changes, the use of targeted supplements and exercising. These treatments should never be ignored and they may have a profound effect on your overall health (not just your thyroid health). When you consider natural therapies it's always important to find therapies which are considered "high reward and low risk". These therapies should not cause any harm and they have the potential of helping improve your current situation. An example of such a therapy would be dietary changes. It's almost ALWAYS a good idea to improve your diet, to eat more vegetables, to reduce the amount of sugar that you consume and so on. It doesn't matter what medical condition you have, this is just a good idea. Dietary changes - Cut out sugar, refined carbohydrates, processed foods and consume more fruits and vegetables. Exercise routine - Make sure that you exercise daily or at least stay active. Supplements - Supplements such as iodine, zinc, selenium and Vitamin D can help provide your body with the necessary nutrients it needs to function. Many people in developed countries are also deficient in many of these vital nutrients. Stress reduction - Highly stressful situations can trigger the release of cortisol which may interfere with thyroid function. Stress can also trigger autoimmune disease such as Graves' disease (a cause of hyperthyroidism). Make sure that you manage your stress. Subclinical hyperthyroidism is a thyroid disease found on the hyperthyroidism spectrum. This condition is diagnosed based on certain thyroid lab tests and patterns and can be suspected in people who have early symptoms of hyperthyroidism such as bone loss or heart problems. Even though this condition represents a complex metabolic problem for the body, it's not well known how best to treat it. Treatment should only be initiated in certain patients and in those who the benefits of treatment outweigh the risks. Remember too that some conditions can temporarily result in subclinical hyperthyroidism which means you need to be diligent about the cause of your condition. Searching for the underlying cause can help you to understand if you need to pursue treatment or if your condition will fade naturally over time. Do you have subclinical hyperthyroidism?